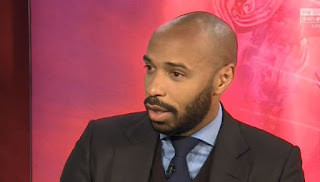 In an interview with Sky Sports Arsenal legend, Thierry Henry has picked the team that will end up in top 4 this season. "I think if they ever make it into the top four it'd be amazing." "First and foremost they need to beat Man City on Thursday and then close the gap to Chelsea." The Arsenal Legend stress on by saying, he believes with Manchester City in 1st position and Manchester United behind them, Liverpool sitting in 3rd. Henry believes Tottenham are likely to occupy the fourth position leaving Arsenal and Chelsea out of the Champions League spot. "Chelsea right now, they've obviously played Manchester United away, they are playing Man City away so they are having some difficult games at the minute." "You would like to think they might go on a run after that. It's going to be a fight." 'Four weeks ago I said Chelsea would be challenging for second! Now, look at where they are right now! They are in trouble after losing back-to-back games recently, especially at home against Bournemouth. "It looks like it's going to be a battle between Tottenham and Chelsea and the way the two teams are playing now you will back Tottenham."